I talked about learning to be truly independent, immersing in the beauty of different cultures, knowing myself better and above all, learning to appreciate Malaysia even more. Being far away from home at the capital of United States, Washington D.C., I want to write down some thoughts towards Malaysia – a place I call home on this special day of September 16. More often than not, we tend to take things for granted. We do not appreciate sometimes the simplest things in our lives that bring us so much pleasure. We do not seem to realize that we have so much more than a lot of people in the world. And we have to admit, sometimes we take Malaysia for granted, too. Located along the Strait of Malacca and Sabah, Sarawak across the South China Sea; Malaysia has been a center of trade as early as in year 1400. In a region which is relatively peaceful, we do not face any major natural disasters as well. A bubbling, bustling melting pot of races and religions where Malays, Chinese, Indians, Iban, Kadazan and many other ethnic groups live together in harmony. We live in multiculturalism; we live in a dynamic society which itself is already an attraction. 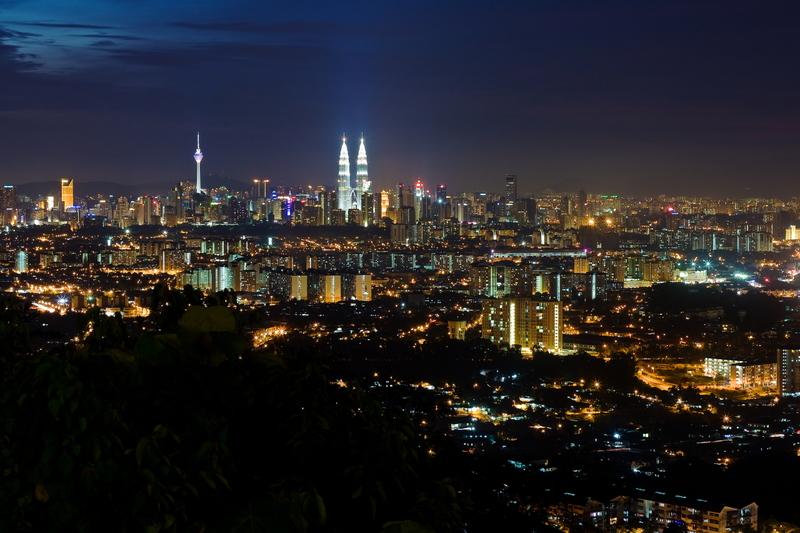 Malaysia is a gastronomical paradise – a food heaven which visitors possibly will gain some weight after visiting. From mamak stalls which open 24 hours serving the best Teh Tarik and Roti Canai in town to Penang Assam Laksa which ranked no. 7 by CNN as the most delicious food in the world, Malaysian welcomes the world through great foods. Halal Arab cuisines, Chinese foods, Malay foods, Indian Curry, Thai Tomyam, Nyonya foods, Western foods – you name it, you find it. We have some economic achievements and enjoy as a relatively middle income nation with unlimited potentials. We have some world class infrastructures like the Petronas Twin Towers which is still the tallest twin tower in the world; an economy which is ranked 21 out of 142 countries in the Global Competitiveness Report. Most importantly, many Malaysians across all walks of life are impacting this world in a positive way – Tan Sri Tony Fernandes the CEO of Air Asia, which is the best budget airline in the world; Tan Sri Dr Zeti Akhtar Aziz who is one of the best central bankers and most powerful women; not to mention hundreds of thousands Malaysians who are staying overseas and play a major role in business, politics and community. For example, Pua Khein-Seng who invented USB Drive and CEO of multi-billion electronic company in Taiwan. But we as Malaysians also know, amidst a time of promising opportunities and future; this nation is at a crossroad. We are in the middle income trap, there are many problems and it is just 9 years from 2020 – a year which we set ourselves to be a fully fledged developed nation. The abolishment of Internal Security Act (ISA) announced yesterday is a giant leap towards a brighter tomorrow. But still more efforts need to be done. Every Malaysian regardless of backgrounds should play an important role to build a better nation and the time to do it is now. Today, I have 5 wishes. Some of the wishes might seem to be unrealistic to you but if we dare not even dream, then it will never, ever come true. 1. Hey politics, enough is enough. Get the jobs done and all of us shall move forward together! I believe many Malaysian are non-partisan who support good policy and effective administration. What we want is really simple. We want to see a better public transport so we do not have to trap in the heavy jam everyday; we want to have a lower housing price which every citizen can afford; we want to have increasing salary to cope with inflation; we want to have a safe neighborhood; we want to see our public universities, at least 1 or 2 to be in QS World Universities Ranking Top 100. Get politics out of education and business, then many things will be fine. 2. Less bureaucracy and be more competent. Government agencies have improved tremendously to be effective and efficient over the past few years, for instance Malaysians now we can get our passport done in less than 2 hours. However, there are still rooms for improvement. We know how the problem is like – it is cost ineffective and wasting time. 3. Stop complaining and start working. Some of us complain a lot in the coffee shop or social media. But complaints but no action do not bring any change. Roll up our sleeve and get the job done is the whole point. Be a change maker. Be the change you want to see in this world. 4. 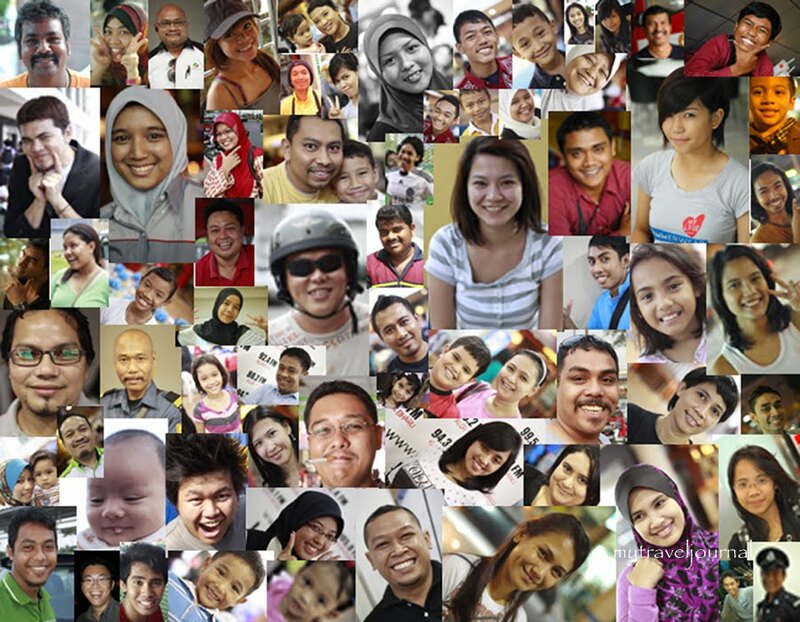 Be a truly 1 Malaysia. I support the ideal of 1 Malaysia. But whether 1 Malaysia is as a rhetoric or has come true remains as a hot debate topic. But we Malaysians know, the true 1 Malaysia spirit pervades in the air across the streets from Perlis to Sabah. We have good friends from different races and there is no problem at all. It’s real 1 Malaysia in KMPP (Penang Matriculation College) where each of us mixed so well and had real fun. Malay, Indian and Chinese performed together in Chinese New Year. Good job Poven the dancer and Syazni the master of ceremony! Brother Hatim Dziauddin represented University Malaya Medical School Islamic Society passing fund raised for King Scout Beh Kuan Kyn. We did not know each other and he got the fundraising news from Facebook. Upon raising the fund, he came all the way from Kuala Lumpur to Penang to pass the fund. This is real 1 Malaysia. We must cherish it. 5. Be a proud Malaysian. The short film – “Undilah” is really interesting and strikes right to the point. If you have not watched it, please do! Yes, Malaysia has some problems to be solved. But which country is not? On this meaningful day of September 16, we shall live up to the true spirit of Malaysian. Respect and embrace the differences. Let us work hard together for a better tomorrow! Let us cherish and appreciate this beautiful land which is our home – and the beauty shall last forever to many generations to come. As Apple announced iCloud as the new way to store and access our content – We knew that cloud-based system is going to change the way we live, sooner or later. Bulky hard disk might just go into history like how USB thumb drive replaced Floppy Disk. Dropbox, the online sharing folder system is just one of the good examples. In campus, students print a lot for assignments and research papers. WEPA Cloud Printing at Marymount University is something very student-friendly and documents can be uploaded anytime and be printed out from the WEPA kiosks which are located at library and dorms. WEPA Kiosk is a touch screen machine which prints documents uploaded through internet. If your college has a WEPA service, you can just log into https://www.wepanow.com/ and sign up a student account. For Marymount University, it’s free to print black & white documents and 50 pages maximum per printing! Upload your document to the website and it will be stored in the cloud system. I just uploaded International Finance homework and ready to print it at WEPA Kiosk in Gerard Hall, where I stay. Sign in with your Marymount Student Email & Password to access into the account. 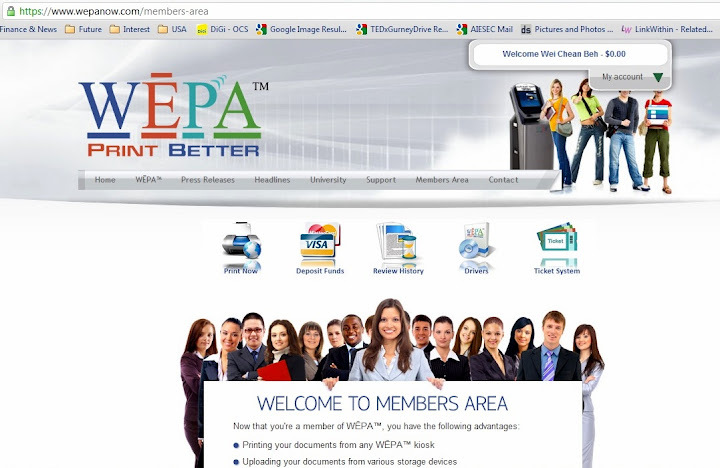 Select documents you want to print and click WEPA Account… and here you go! The purpose I’m writing is quite a number of students in Marymount do not know we can actually upload at laptop and print it for free! p/s: Wilson does print a lot of papers especially for his International Finance class. He needs to complete 2 new chapters of homework every week before the class. “I hate having to use the first person. Nearly everything I’ve done in my life has been accomplished with other people. Yet when when you write a post like this, you’re forced to use the narrative “I” when it’s really the “we” that counts” – Jack Welch, CEO of GE 1981 – 2001. I bought Jack’s 2nd hand, well maintained hardcover biography at Unique Store at $1.5 (RM4.50) few hours ago. The above sentence is written at the prologue. I can’t agree more with Jack – who hailed as the greatest business leader in century by Fortune. I am very grateful to be able to come to US and experience a taste of different cultures under Global Undergraduate Exchange Program. But I can never make it without the support and help from seniors, lecturers, friends and family. I remember and thankful for that. Global Undergraduate Exchange Program is a program funded by US Department of States. More than 100 students across the globe were chosen to study for 1 or 2 semesters in different universities in US. This program has been running in Malaysia since 2008 and I’m the 4th batch of Global UGRADers Malaysia with another 7 bright student leaders. Global UGRAD Program is administered by World Learning – which works directly with the State Department. In Malaysia, MACEE (Malaysian American Commission on Educational Exchange) is fully responsible for the interview and selection process. So here I’m am – Arlington, Virginia state! Virginia is often nicknamed as “Mother of Presidents” after 8 US Presidents born here. Arlington where I live is a county with a population of 200,000. Arlington is ranked among the top counties with highest median household incomes and CNN Money ranked it 7th in US in its listing of “Best Places for the Riches and Single”. The smart urban growth concept has been proven successful in Arlington. Due to its close proximity to Washington DC, Arlington is headquarters to many departments and agencies including The Pentagon, the Department of Defence, Drug Enforcement Agency, Defense Advanced Research Projects Agency and etc. Arlington is like Petaling Jaya while Washington DC is Kuala Lumpur. Arlington is in Washington Metropolitan Area (the concept is like Klang Valley or Greater KL) which has a population of 5.6 millions together with Maryland and few other principle cities. Washington Metropolitan Area is the 7th largest metropolitan area in US. As a national’s capital, it is the most educated and by some measures the most affluent metropolitan area in US. I always have a passion in urban planning and cities. It is so great to be in the location where I can go anywhere in the area by subway. The Metro Subway started operating since 1976 so some of the stations are very old. It is the 2nd busiest subway after New York City. Due to its efficiency and good connection, I can easily go to DC core zone with a few stops. The university shuttle runs every 20 minute from main campus to Ballston MU Station the orange line. My host university is Marmount Univeristy – a private, catholic university with about 5,000 students. The campus is not big but it has almost everything. Basically you can explore the entire campus by not more than 20 minutes walk. Because it is small, everyone knows everyone in the campus – applies to senior year (final year) students! I’m the 1st Malaysian student to study here! In fact, I have not met any Malaysian after spending more than 2 weeks in DC areas. International Student Service officer Aline promised to connect me with Malaysia Embassy. According to her, Malaysia Embassy is very active in events. Only at here I can truly understand the meaning of being independent. Besides, this experience opens up my mind broadly – the world is so large so don’t keep yourself in just one circle. Our skin colors might be different, white black or yellow; but to me there is only one race in this world: The Human Race. I stayed on Global Thinker Residential Community at Gerard Hall. I share a room with my lovely roommate, Vincent who is from Pennsylvania. I can safely say that this floors houses some of the most interesting characters from all around the world; from US, South America, Africa, Middle East and also few from Asia. All are very friendly, helpful and nice! President of Marymount University, Dr. Matthew Shank is also a very friendly and down to earth leader. He just arrived to this campus few months and I believe MU can achieve greater heights under his leaderships. He welcomed Tran (Global UGRADer from Hanoi) and me to join this community! One thing I really like about this campus is its cafeteria. It’s just like a restaurant with nice music in the air! This dining hall is actually run by Sodexo, one of the largest food services in the world which based in France. It’s like hotel buffet style. You can take whatever you like if you have a full meal plan: from sushi, pizza, pasta, chicken, beef, salad, fruits, sandwiches to desserts! The main dish changes every day and so far I have not finished trying the foods! Coffee, chocolate or coke? Which C you want? This is Marymount Univeristy Business School at Ballston the city area. I have to take a shuttle which runs every 20 min to here. My Investment, International Finance and Financial Management classes are conducted here. Ballston area at Arlington, view outside from my business school. I have gone to 3 malls so far – Ballston Mall, Pentagon City Mall and Tysons Corner. The later is the best but the bad thing metro line doesn’t reach there. Stuffs in US are really cheap if you work and earn here. If you convert to Ringgit everything is still expensive unless during big sales! If you ask me how’s life in US? I will say it’s great. I love Washington DC this city so much – a young city yet so rich in history, cultures and politics. People here are very friendly and helpful. Ask if you don’t know and they will help. Classes here are really different as in USM. We might use the same textbooks but the teaching method here focuses more in critical thinking than memorizing. Lecturers distribute latest news from Yahoo Finance and encouraged us to discuss and analyze. And, there is no bureaucracy. My class registration was done in few minutes and no flaws. Student emails and online portal are utilized effectively. However, the more I find out the better sides of US, the more I think Malaysia very blessed. For example we don’t have Hurricane Irene. At the time I’m writing this my Facebook wall is full with Indonesia’s earthquake tremors in Penang – but we are still very safe. Malaysia has so much opportunities and if we can do it right, it can be one of the greatest nation too. Phases of cultural adaption – seriously I don’t know which phase I’m in – it’s like a mixture of honeymoon, cultural shock and adjustment. So I will try to stay in the honeymoon period like the new married couples! Haha!